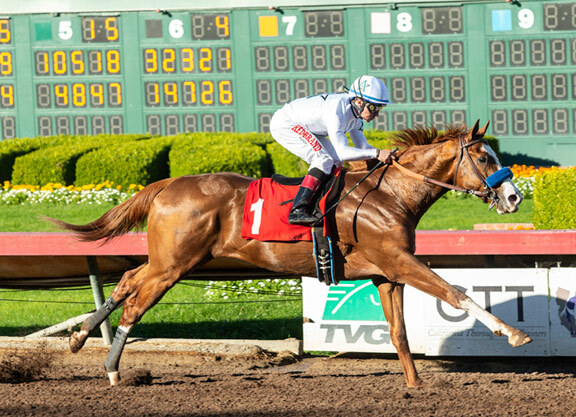 As his odds of 1-5 make perfectly clear, there was nothing improbable about Improbable (City Zip)’s victory in the GI Los Alamitos CashCall Futurity. Nor was there anything improbable about a colt of his pedigree establishing a record of three wins from three starts as a 2-year-old. His sire, the ultra-tough City Zip, won five of his 11 juvenile starts, including the GI Hopeful S., and this son of the fast Carson City has also been represented by the Breeders’ Cup 2-year-old winners Bulletin (2018 Juvenile Turf Sprint) and Catch A Glimpse (Juvenile Fillies Turf). 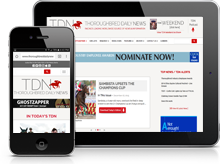 It was on the undercard of the opening day of the Breeders’ Cup that Improbable had earned ‘TDN Rising Star’ status with his effortless victory in the Street Sense S., over a mile of the Kentucky Derby course. Sadly, City Zip had to be euthanized at the age of 19 in July 2017, and his long-standing foot problems appear to have prevented him carrying out his stallion duties that year. At least he had been able to cover 129 mares in 2016, so we can look forward to a final crop of nearly 100, which will race in 2019. No fewer than seven members of this 2017 crop sold for prices between $250,000 and $500,000 as yearlings, which illustrates the progress City Zip made after starting his stallion career in 2002 at a fee of $7,500. He was originally based at Contemporary Stallions in New York in 2002, before being moved to Lane’s End Farm at the end of 2004. City Zip wasn’t just a 2-year-old. Although his tough juvenile campaign might have drained a less durable individual, City Zip made a further 12 starts at three and he was good enough to win four more stakes races, including the GIII Jersey Shore S. and GII Amsterdam S. All four of his 3-year-old victories came over six furlongs. Add in the fact that his sire Carson City had gained all of his three graded successes over six furlongs and it seemed fair to assume that City Zip would primarily be a source of speed. The fact that his two-year-younger half-brother Ghostzapper was versatile enough to win the Vosburgh, the Met Mile and the Breeders’ Cup Classic didn’t seem particularly relevant, as his sire Awesome Again possessed much more stamina than Carson City. However, City Zip proved to be much more than a one-dimensional speed sire. He proved very proficient at siring smart performers on turf, as well as dirt, and quite a few of his progeny have been effective around two turns. Two who combined turf prowess with a degree of stamina were Catch A Glimpse, who added the GI Belmont Oaks over a mile and a quarter to her Breeders’ Cup success, and Dayatthespa, a multiple Grade I scorer who landed the Breeders’ Cup Filly & Mare Turf over the Kentucky Derby distance. Another who enjoyed Grade I success over a mile and a quarter was City Zip’s admirable son Collected, who defeated Arrogate and Accelerate to take the 2017 Pacific Classic, prior to his second to Gun Runner in the Breeders’ Cup Classic. In the process of siring all these good winners, City Zip established an Average Earnings Index of 1.68, whereas his mares’ Comparable Index stood at only 1.41, which is another way of saying that City Zip often succeeded in upgrading his mares. It is going to be interesting to see whether City Zip can pass on his prowess as a sire to his sons. Although City Zip is easily the most successful of Carson City’s sons, with his ten Grade I winners, four other sons of Carson City succeeded in siring a Grade I winner, these being Pollard’s Vision, Flying Chevron, Hear No Evil and Cuvee. As yet, no son of City Zip has been responsible for a Grade I winner, but that looks set to change. The precocious Run Away And Hide has a creditable record with six graded winners, despite never standing at more than $7,500. Another of City Zip’s fast sons, the dual Grade I winner Palace, is based at Spendthrift, and will have his first runners next year. Collected is well placed to make a much bigger impact, as he begins his stallion career at Airdrie at a fee of $17,500, and Improbable has already done enough to be taken seriously as a stallion prospect. There is also good reason for thinking that Improbable has a good chance of becoming another good performer at up to a mile and a quarter for City Zip, as there is stamina in the bottom half of his pedigree. The one possible weak link is Stravinsky, the champion European sprinter who sired Improbable’s second dam Our Rite of Spring, who won the Exogenous S. over 8.3 furlongs at Aqueduct. It is interesting that Improbable’s dam, the four-time winner Rare Event, is a daughter of the Belmont and Breeders’ Cup Classic winner A.P. Indy. I have pointed out in the past that A.P. Indy’s son Bernardini has enjoyed considerable success with mares by City Zip’s sire Carson City. This cross’s statistics currently stand at 20 foals, 18 starters and 15 winners, with five of the 15 enjoying black-type success. Among them are the Grade I winners Cavorting and A Z Warrior, and a mare bred this way is the dam of GI Hollywood Derby winner Mo Town. Improbable’s dam Rare Event cost $400,000 as a yearling. Improbable comes from a highly successful Darby Dan female line which is no stranger to classic success, with the Futurity winner’s fifth and sixth dams being Luiana and Banquet Belle. It was Banquet Belle who provided John W. Galbreath with Primonetta, a champion older mare, and Chateaugay, a winner of the Kentucky Derby and Belmont S. Another of Banquet Bell’s foals, Luiana, gave Darby Dan Little Current, winner of the Preakness and Belmont. Improbable’s fourth dam, Darbyvail, was a winning daughter of the Epsom Derby winner Roberto and his third dam, Turkish Tryst, is by Turkoman, who gained two of his GI wins over a mile and a quarter. Turkish Tryst passed on some of the family’s stamina to her Danzig colt Hard Spun, who stayed a mile and a quarter well enough to finish second to Street Sense in the Kentucky Derby and to Curlin in the Breeders’ Cup Classic.